Last weekend, we took our bloggers on a date to Cafe Karma, a place where you are served what you deserve. What we got was a smorgasbord of blog posts - ranging from thoughtful to fictional, with a smattering of real life experiences. Here are the best posts of the week. 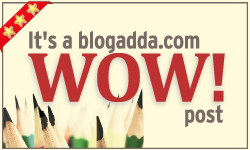 Enjoy your stay at Cafe Karma and don't forget to write for the next WOW prompt! Great going guys! You surely have earned some good karma by getting us to read some really great blog posts. Flaunt your WOW badge! Nice to have collection of good blogs. I love reading and I guess I had a good karma that I stumbled upon this place. Thank you for sharing the links.